Lately, there's been a lot of talk about how YA is too dark and whether or not that's good for teens. 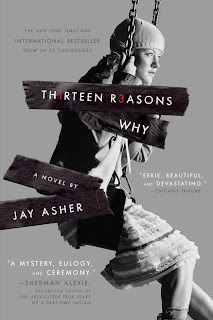 I have a lot of feelings on the subject, but one book I know that tackles a dark issue and has been a huge source of inspiration and hope for teens is Thirteen Reasons Why by Jay Asher. In fact, it was pretty awesome to see Entertainment Weekly do a story on the book in this week's issues. And the new site, the 13RW Project. It's a pretty cool site and you'll definitely want to check it out and see the power a book can have! Courtesy of Penguin, I have two paperback copies of Thirteen Reasons Why to give away. This giveaway is open to residents of the United States. Winners will be emailed after June 20th, 2011.